Until very recently, many classic Asian ingredients were practically unknown to Western cooks. That’s all changed now, with cutting-edge chefs introducing exotic flavors to an eager audience. Now the curtain has been pulled aside and some, at least, of the secret ingredients used in their culinary wizardry have been revealed. One of these is yuzu kosho. Yuzu kosho, a traditional condiment with an amazing 1-2-3 punch, comes from the southeastern corner of Japan. Originating in Kyushu prefecture (hence the name kosho), this boldly flavored paste combines three potent flavors: grated yuzu peel, sea salt and finely ground hot chili peppers. That’s it: absolutely nothing else. This flavorful triumvirate creates a powerful sensation that is at once intensely salty, citrusy and spicy. 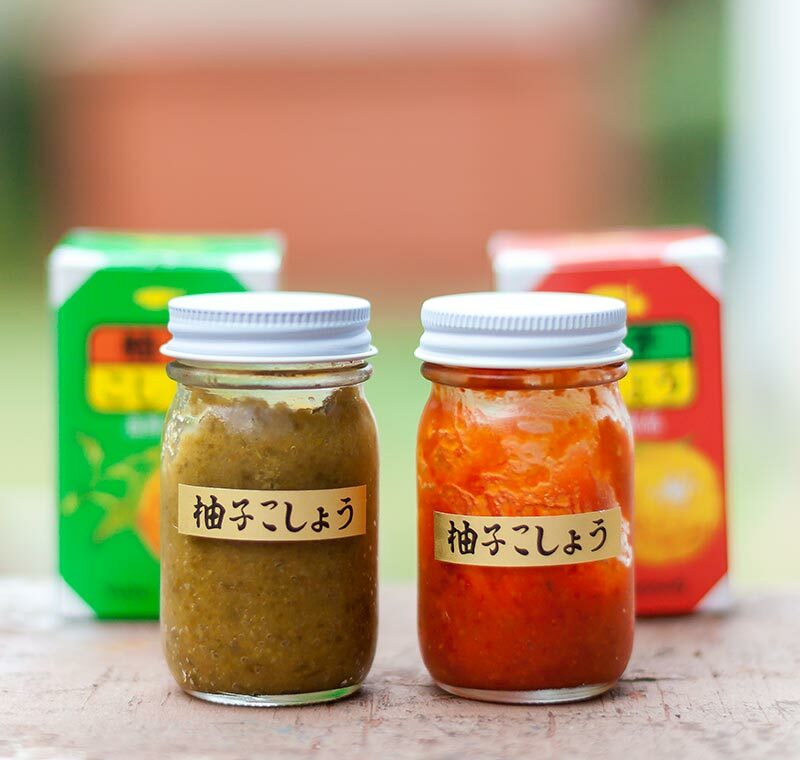 Yuzu kosho comes in two varieties, red and green. 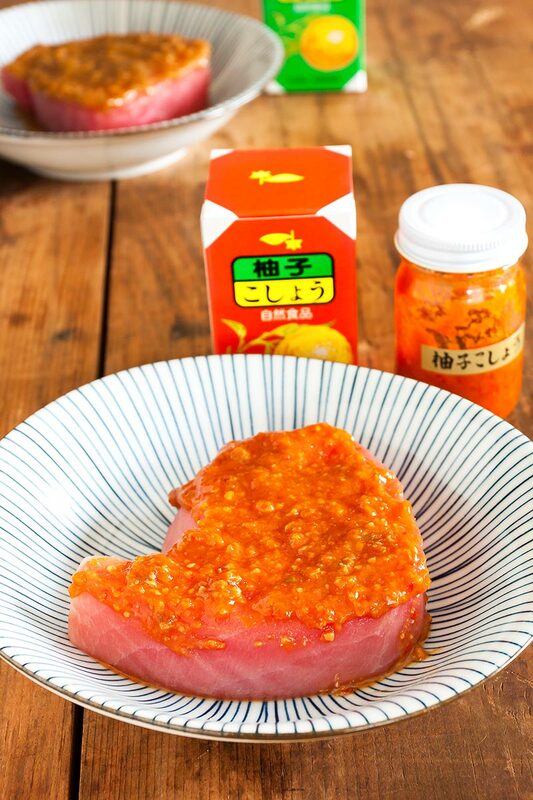 Red yuzu kosho (aka kosho) is made with ripe, red chilis, while green yuzu kosho (ao kosho) is made with green chilis. Otherwise, they’re identical. Yes, there is a distinct difference between the two. Both are excellent, but each lends itself to slightly varying applications. Let your taste buds be your guide! While yuzu kosho is an essential element in many traditional Japanese recipes, it crosses cultures easily, infusing its intriguingly spicy-salty-tangy elements into Western preparations. It’s an ideal ingredient for sauces and marinades, especially when used with poultry or seafood dishes with an East-West flair. This unusual glaze adds just the right touch to complement the rich flavor of fresh ahi tuna – or any meaty, firm-fleshed fish. Mirin, a sweet, low-alcohol rice-based cooking wine balances the saltiness of the yuzu kosho. Savory miso brings it all together while allowing the pleasant heat from the chiles to shine through. We like our tuna cooked rare (or at the most, medium-rare); a brief searing over a very hot fire adds just the right touch of charring, while leaving the interior of the fish extremely moist, juicy and mouthwateringly tender. While yuzu kosho has probably not made it to your local grocery store, never fear. It’s readily available at our retail website, earthy.com, along with dozens of other hard-to-find Asian ingredients. Mix the miso, mirin and yuzu kosho together until smooth (should be the consistency of heavy cream). Spread the mixture evenly over both sides of the tuna with a spoon. Set aside for 30 minutes or longer. Preheat the grill to high. Oil the grate well to prevent sticking. 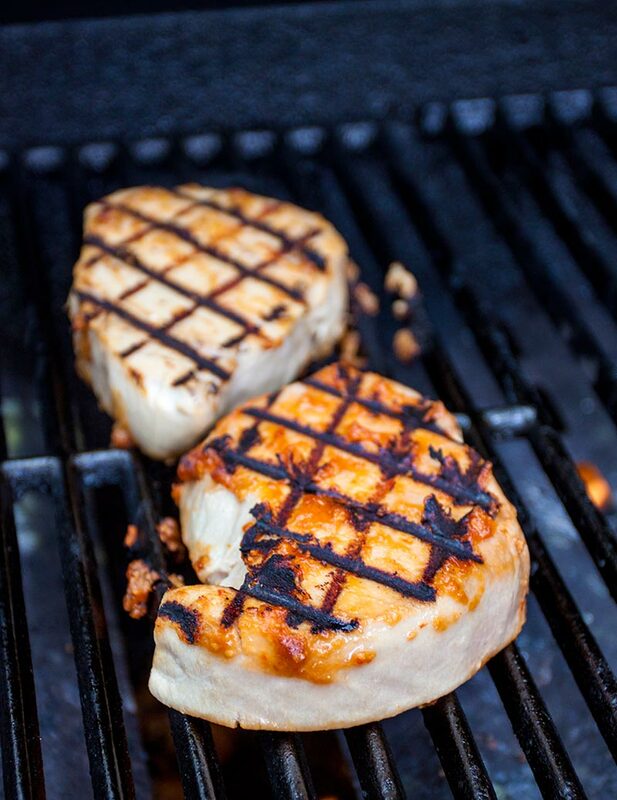 When the grill is hot & ready, place the tuna on the cooking surface. 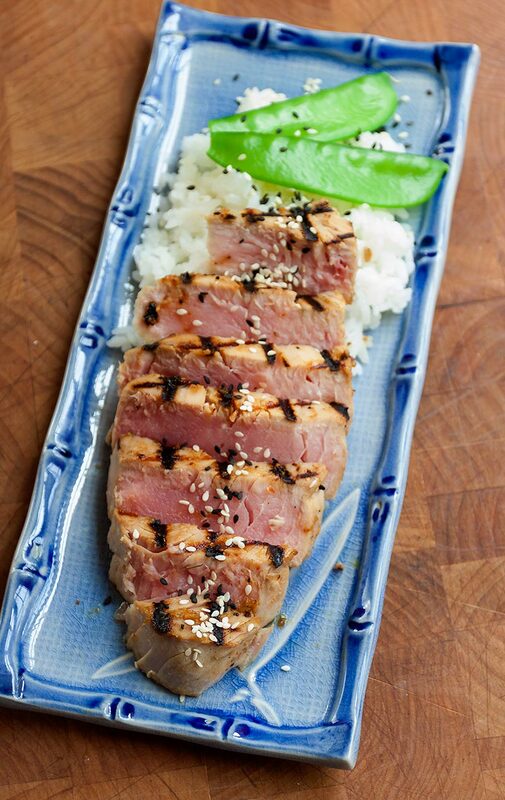 Cook for 1 – 2 minutes, then rotate the tuna 90 degrees to create attractive grill cross-hatch marks. Cook for another minute, then flip the tuna to the other side. Cook for another 1 – 2 minutes (rare) or until desired level of doneness is reached. Remove the tuna steaks to a plate and allow to cool for a few minutes. Just before serving, slice the tuna across the grain into 1/4 inch thick pieces with a very sharp knife. Arrange the sliced tuna artistically on serving plates and sprinkle with black and white sesame seeds. We served ours with freshly made sushi rice and some colorful steamed snow peas, but the tuna is so moist, so juicy and so flavorful that it doesn’t really need any extra embellishments.